A ‘mislaid’ Victoria Cross has gone on show at the Brighton Museum in Sussex. The medal was awarded posthumously to 42-year-old Major George Godfrey Massy Wheeler of the 7th (Hariana ) Lancers. It was found by museum staff who were searching for items to display to mark the centenary of the beginning of the First World War. Andy Maxted, curator at Brighton Museum said: ‘We were searching through our collections database last year, looking for objects that might enhance the War Stories exhibition. During the search we came across a reference to the Massy Wheeler VC along with a full size and miniature copy, strangely enough, in a box of Decorative Arts jewellery. ‘We then tracked down the remainder of the medals which we found in a general medals box that also contained a telegram from the King to Massy Wheeler’s widow expressing sympathy on the news of his death. We were obviously delighted when we found the VC. The medal is display alongside Major Massy Wheeler’s other campaign medals in the Prints and Drawings gallery at Brighton Museum until 7 June 2015. 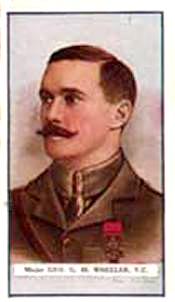 Massy’s commendation for the Victoria Cross stated: ‘For most conspicuous bravery at Shaiba, Mesopotamia. On the 12th April, 1915, Major Wheeler asked permission to take out his Squadron and attempt to capture a flag, which was the centre point of a group of the enemy who were firing on one of our picquets. ‘He advanced and attacked the enemy’s infantry with the lance, doing considerable execution among them. He then retired while the enemy swarmed out of hidden ground and formed an excellent target to our Royal Horse Artillery guns. Major Massy Wheeler is buried in Basra War Cemetery. For more information about the dispay, click here. This entry was posted in Events and tagged 1915, 7th Hariana Lancers, Brighton, Brighton Museum, centenary, First World War, First World War Centenary, Indian Army, Iraq, Massy Wheeler, Medals, Mesopotamia, news, UK News, VC, Victoria Cross, WW1. Bookmark the permalink.